A good floor is something that can not only elevate a room from looking utilitarian and drab to being a beautiful space, it also makes a huge contribution to your comfort, particularly if you go barefoot in your home. A room with only a few pieces of furniture can look finished and graceful if it has an appealing floor, but no amount of decorating will compensate for one that basically looks bad. If remodeling your home or office, take a few minutes to think about flooring. Even if you don't consciously notice it every day, the surface you walk on is constantly in your peripheral vision. 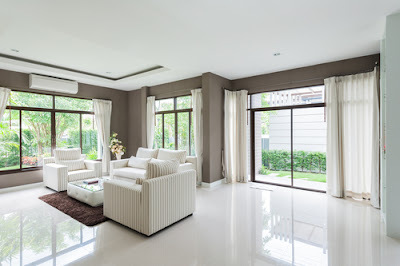 It's your choice whether you want to go for luxury or just something that's easy to clean and maintain, but you will generally be stuck with whatever you choose for the next decade or so. If you're not the type of person who likes to compromise when it comes to quality, solid hardwood flooring is for you. The instant guests step into your house, they will get the impression that they're somewhere with class, even if they don't notice the floor in particular. Solid hardwood has some drawbacks, though, the first of these being its cost. Solid wood flooring can cost $30 per square meter or more, and is easily damaged by dragging furniture across it, liquid spills or dogs with untrimmed nails. On the other hand, you'll never need to replace it: sanding it down and applying a new coat of varnish will make it look brand new again. Wood flooring is never going to go out of fashion, but solid planks or parquet aren't your only options. 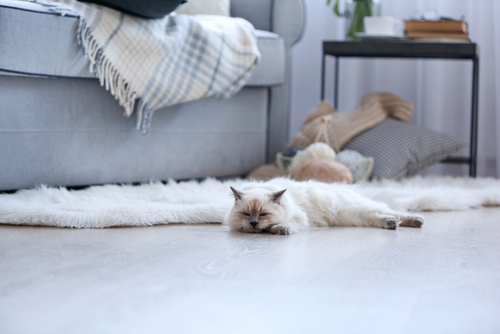 Laminated flooring is more durable than solid wood when it comes to resisting liquids and scratches, although it can't be refinished more than a few times. It's somewhat cheaper at around $15 per square meter and, in case peace and quiet is important to you, won't develop creaks and groans due to humidity, and absorbs sound rather well. Tiles offer so many home flooring options that they almost deserve an article of their own. Very difficult to damage, very easy to clean, and totally waterproof, tiles are available in an almost infinite range of colors and designs. Cost varies significantly depending on manufacture. Whether you hire a contractor or go the DIY route, make very sure that the cement completely fills the space underneath each tile – if you get a hollow sound when you tap it, it's certainly going to crack at some point. Don't choose a certain type of tile based only on the design, consider the tactile experience bare feet will experience, and try to purchase tiles which aren't excessively slippery when wet. Many tile floors don't look their best due to inadequate cleaning: avoid letting soap buildup dull your floors, and periodically scrub out the grout between the tiles. All tiles from a given line look the same. It's not immediately noticeable, but the repeating pattern can become ever so slightly annoying when you spend a lot of time in a room. Each cut of stone, however, is completely unique. Marble is perhaps the standard, but don't neglect looking at materials such as slate, granite and limestone. When choosing home flooring, what other people regard as trendy isn't relevant – you're the one who has to live there. Stone feels wonderfully cool and requires little maintenance beyond a coat of sealant every few years. How much you will have to spend depends on the material you choose, but stone flooring is generally not a bargain option. If function is more important to you than fashion, vinyl flooring is a good choice. Vinyl sheets and tiles are available in all the colors of the rainbow and can even realistically simulate materials such as wood or stone. Cleaning is a breeze, and with normal use you can expect years of wear out of it. It's also cheap, and you have the option of installing soft, sound-absorbing flooring without the cleaning hassles carpets have. In any room, the floor is a large surface, and its appearance can either make it seem comfortable and practical, or cause it to be impossible to have it look good. 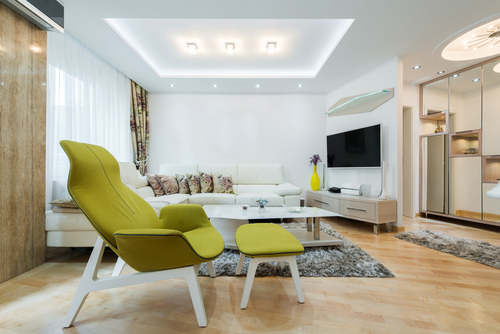 Your new floor will be with you for years, so don't be impulsive when making this decision. · What you see affects how you and your guests will feel. Warm, heavy colors are not generally a good choice in Singapore, where temperatures are high and apartments small. Lighter tones help create an impression of cool airiness. · Use loose, easily washable rugs to focus attention. A small, tasteful mat under a coffee table subtly declares that this is the spot where people get together. · It's not only the design that's important, execution plays a huge role. There's nothing stopping you from installing your own flooring, but this is more difficult than most people realize. Just the posture you'll be adopting for hours at a time is hell on your back and neck, and taking shortcuts through either ignorance or laziness will leave you stuck with a floor that really could look much better. Since the biggest part of flooring costs tends to be buying the material, getting a professional to install it is a reasonable additional expense. · Take your furniture and other fixtures into account. If most of your furniture is made of dark wood and you have a wooden ceiling, installing wood flooring too will make the room look like it belongs on a ship from days gone by. This may be what you want, and it may not. · Listen to the experts! Every one of us can't know every little thing, so treat your contractor's suggestions with some respect. Someone who spends most of his workweek thinking about floors is bound to know a thing or two. The best floors are never noticed. You walk across it without being aware of how the room looks a little larger, feels a little cooler and is generally more comfortable to be in. This subtle effect can contribute hugely to a home that has a serene and joyful atmosphere, so it's worthwhile to think hard about what you desire in home flooring.